Got up at 4 a.m. and enjoyed some great hot coffee. News came on so I watched the news and flipped channels. Checked my phone: sunrise - 6:53. Plenty of time to go catch bait. Hooked up the boat. Piddled around in the crib. Came in and drank some coffee. Uh oh. 5:45 a.m. I launched at 6:30 am and it was pretty light!! No problems I say to myself. There are shad everywhere!! Moved out into the channel and looked around. No shad to be found. A bait ball came by and I threw the net. 1 shad. I repeated this numerous times. I was up to a total of 3 shad in the tank now. Daylight was upon me....bumer. I had 3 shad. Headed to the cut on North Island and threw top waters, sassys, and cohos. Nothing. Headed over to Long Point and repeated. No takers. No bites. Nada. Wind was from the SE and it looked like it was heading right into Rock Creek. Birds were trying to work but they weren't all that excited. I knew I was in the right area as there were 3 guide boats there. At 9:30, I saw shad flipping right in front of the boat. I put on a Belly Spinner with a 2" sassy (baby bass color) and it was on. The Belly Spinner I was using was 5/8 ounce. I'd cast it out and count to '5' then start my retrieve. Caught fish constantly until about 11:30 or when they turned off. Smallest I caught was 17" Largest I boated was prolly 24". I had one hit the Belly Spinner so hard it almost jerked the rod outta my hand! I fought it a bit but my braid-to-mono dual uni knot failed and I lost it. My PB is 16.5#. 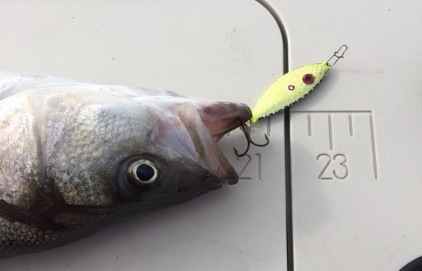 I hung one on a ReAxtion Lures RL150 slab (yellow). It was a monster. I fought her for probably 3 or 4 minutes. Finally I get her up where I can see her. She is huge. I would guess 18 to 20 #. Then, I notice my net is at the other end of the boat. I tried to work her towards my net and I almost made it but she rolled over on time and threw the hook and was gone!! I tried to catch those 3 shad and put out a live bait rod but the water in the tank was murky (from Highport Marina). Try catching one of three shad in a 35 gallon bait tank. Guide Ken Zachary is out fishing today and he's loading the boat on slabs. Very encouraging for sure!! Excellent report. People really seem to be catching a lot over the last couple of weeks, so hopefully I'll be able to join in this weekend. Great report and exciting news! Hi Ax. Good to hear a report on a successful trip. We try to fish Texoma several times every november and this is the incentive we've been needing. Just bought a new food saver vacuum sealer and need to try it out!!! I was going out today with George Pratt. George texted me this morning at 1:40 a.m. saying he couldn't go as his knee hurt too bad. I was already awake with infected sinuses. Neither one of us went. We are old. That's no joke Ax , we are to old ! I hope I don't get old! New neck, new hip, just keep changing out parts!